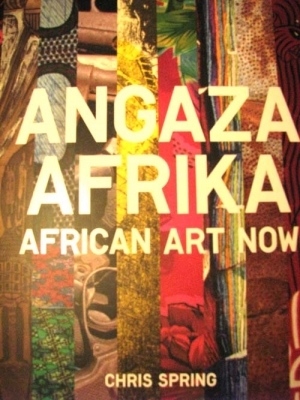 I have stumbled over the new book ANGAZA AFRIKA written by Chris Spring in an ordinary bookshop in Prague. I was surprised to find out that African art got its rightful place in the shelves among western art. I was more delighted when I found several Tanzanian artists there, including the Tingatinga painters. I must say that the choice of these three artists was unpredictable. Who could even dream that the tingatinga painter Mitole would get a space in this gracious book? But then I realized that the choice was great because Mitole represents hundreds of tingatinga artists in Tanzania who never got any word. They, as Mitole, paint from dawn to dusk as “street painters” whom people call naïve. Not few books stated that the Tingatinga style, yes even Makonde started and lives only thanks to tourism as if the artists had not any inclination to artistic expression. ANGAZA AFRIKA is different. Another artist presented in the book is Mr. Charinda. Last time when we met he was angry at me like a buffalo and I escaped only by miracle. But then the fellow artists told me he was angry because he was hungry – the Ramadan time. He has developed his own style and I pray he will continue in his art as long as possible. He is tired now and get problems to hold a brush. The third artist from Tanzania is Robino Ntila. It is not possible to write one sentence about Robino Ntila. But maybe one sentence could characterize the whole book about him: he has fingers everywhere. Now only that book remains to be written…..